*Offered by Progressive Leasing. You own in 12 months or less. Payments match your payday. Easy Regular Payments. 90 day Pay Off Available. Early Buyout after 90 days. One time initial payment of $49.00 plus tax will be charged when a purchase is made at the store. Service described is a rental – or lease purchase program provided by Prog Leasing, LLC or its affiliates. The initial payment is $49. 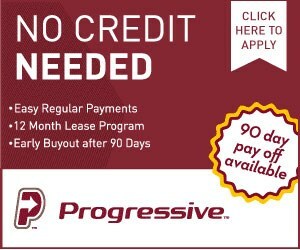 All remaining lease payments will be determined by the cash price of the leased item and the frequency of payments. You will not own the leased merchandise or acquire ownership rights unless you make 12 months of payments or exercise an early purchase option. Not all applicants are approved. See lease for details.